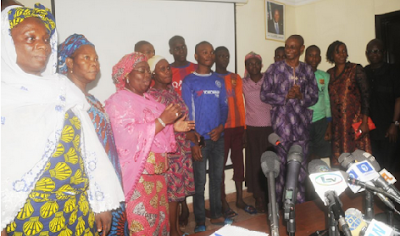 Parents of the recently rescued six students of the Lagos Model College were hugely relieved Friday to reunite with them after more than two months of anxiety. The freed boys are Peter Jonah, Isiaka Rahmon, Adebayo George, Judah Agbausi, Pelumi Philips, and Farouq Yusuf. Moruf Ramon, whose 19-year-old son, Isiaka, was among the rescued students, commended the Lagos government and the Nigerian police for their efforts. Another parent, Beatrice Jonah, said it had been a traumatic experience for her family. According to her, the experience is very difficult to describe as it was better imagined than experienced. ”To me it has been 65 days of trauma but we thank God he is back safely,” she said. The Lagos State Deputy Governor, Dr Idiat Adebule, who received the students on behalf of Governor Akinwunmi Ambode, commended the efforts of the security agencies and the intervention of the Federal Government.